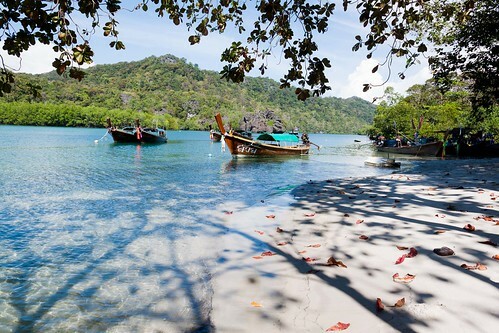 The Koh Tarutao Marine National Park comprises 51 islands, the largest being Koh Tarutao island, which is 26 km (16 miles) long (total area being 152 km²). This is the second marine national park, founded in 1974. During World War II, Koh Tarutao was a prison island (until 1948). It was all the stuff that movies are made out of: inhuman living conditions, no medicine, not enough food and abuse. More than 3000 prisoners (some criminals, some political prisoners) were incarcerated here. Many of them died from malaria here. The prisoners here later became pirates. You can still see the remains of the prison camp at Ao Taloh Udang, in the southeast of the island and Ao Taloh Waw on the east coast. Much of the island is surrounded by mangrove swamps and limestone cliffs, but along the western coast you find beautiful white-sand beaches. But a lot more fascinating than the history is the nature of this place. 25% of the world’s tropical fish species live here, more than 100 varieties of birds, four different species of sea turtles (leatherback, hawksbill, green and olive ridley turtles). The most famous breeding and nesting ground for turtles is at Ao Son, on the Western shore of Koh Karutao island, not far from the beautiful Nam Tok Lu Du waterfall. Most of the island is covered with tropical rain forests, and the highest peak is at 2300 feet (701 meters). Ao Pante Malaka on the northwestern shore is pretty much the main spot of the island – this is where the Koh Tarutao Marine National Park headquarters are located. Here is a biking trail and you can go sea kayaking. There are bungalows, cabins and long houses, and you can go camping on the beach (if you have a permit!). There’s also a small restaurant and an exhibition about the arine park. Toe-Boo Cliff is the place if you want to enjoy a spectacular view – you can already see it from the headquarters, but if you stand there and look around, it’s amazing, especially if you come to see the sun set here. Just be careful when you come back, because there is no light at night. Best to come back before it gets too dark, and bring flashlights just in case. You can come here on your own or with a personal Thai tour guide if you want someone to help you find your way around and assist you in planning trips, accomodation and so on. 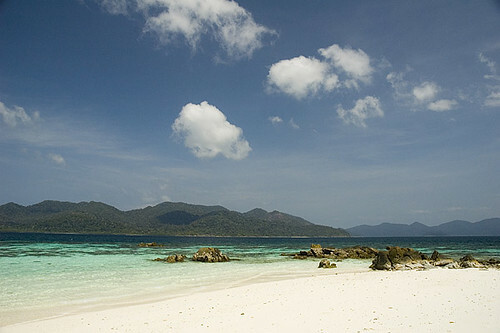 The most touristically developed of all the islands of the marine park is Koh Lipe island. There are all kinds of accommodation, from basic budget bamboo huts to 5-star luxury wellness resorts. The island is undergoing rapid development, but there are still plenty of areas which are relatively quite and peaceful – it’s nothing like Phuket, Ko Samui, Ko Chang or even Koh Tao. One reason for this is also that it is a pretty tiny island that’s in the Southernmost corner of Thailand, and it takes a long trip to get here. Koh Adang island is covered with rain forest and surrounded by colorful coral reefs, and is located just north of Koh Lipe. Koh Adang island is just around 12m² (31km²) small, but it has crystal clear waters, fine quartz beaches and stunning coral reefs. If you go snorkeling or diving around here, you’ll see plenty of colorful fish and corals. There are several waterfalls on the island, the highest being Nam Tok Chon Salat. Even though the island is smaller than Koh Tarutao, it’s just as high: 701 meter (2300 feet). From Laem Son, you can walk 3 km (2 miles) to the Pirate Waterfall – it’s called this way because the pirates used to get their drinking here. 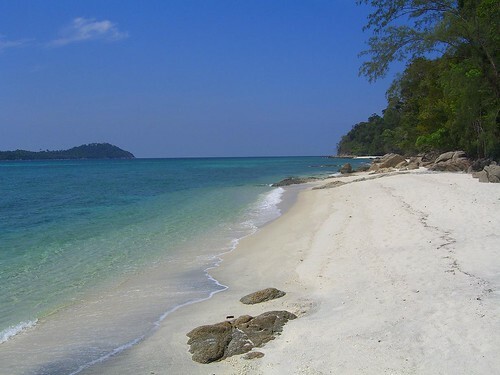 There’s a tiny island nearby (about 18km (11 miles) that is called Koh Khai (egg island). 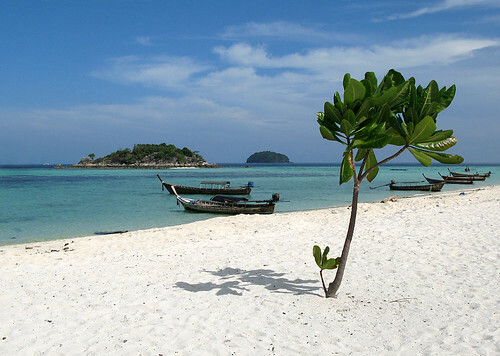 Koh Khai has a lot to offer in terms of diving and snorkerling, and it has a beautiful white sand beach too. But you can’t stay here, the island is too tiny. 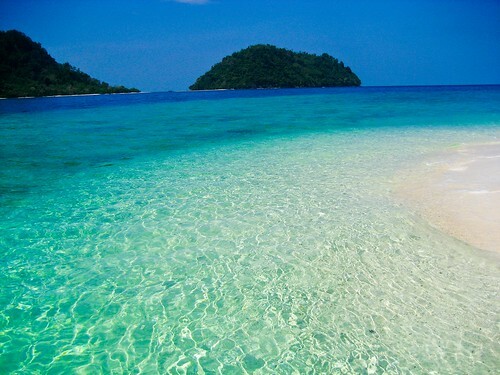 In total the Koh Tarutao Marine National Park covers an area of 1489km² (575m²), most of it being sea.